“Its most important task is to work with gender and ethnicity,” writes the Ministry of Education and Research in the mandate for the fifth consecutive committee. The ministry has already sent both the mandate and the appointment letter for the Committee for Gender Balance and Diversity in Research (the KIF Committee). The committee’s term will run from 2018 to 2021. There are no changes to the KIF Committee’s objective. Launch measures and assess the impact of those measures. Read the new mandate (in Norwegian only). In addition, Kilden genderresearch.no has an observer on the committee. Read the appointment letter (in Norwegian only). 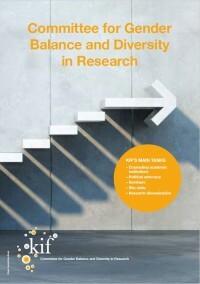 Read about the current Committee for Gender Balance and Diversity in Research (the KIF Committee). Recently, the KIF Committee co-hosted the conference Creating a competitive edge through diversity – leadership for Nordic research excellence towards 2030.